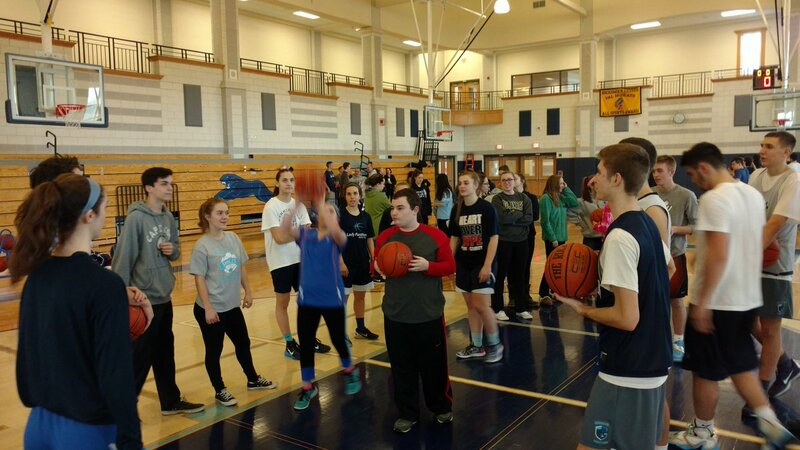 Franklin Matters: "promote inclusion through team practice and competition"
"promote inclusion through team practice and competition"
"This fall, Franklin High School will be introducing a Unified Basketball program. As defined by the Special Olympics website, Unified Sports “Brings together ATHLETES with intellectual disabilities and athletes without intellectual disabilities (UNIFIED PARTNERS) to train and compete on the same team. Participants improve their physical fitness, sharpen their skills and learn acceptance and inclusion while participating in Unified Sports. A primary goal of Unified Sports is to equalize the ability level of Special Olympics athletes with their partners and to promote inclusion through team practice and competition. Franklin’s Unified program will meet two days a week after school, in addition to playing 4-6 games against other teams in the Hockomock League or other regional teams. The first practice is Wednesday, September 13th and the season goes until the end of October. “Last spring, Unified Track was very popular and we hope to continue that with Unified Basketball,” said senior Grace Sameski, who is helping with the program. The Unified Basketball proposal was discussed and approved at the School Committee meeting held on Aug 22, 2017.